In the world of money, which is of interest when we need it, there are three reports that result from the process of gathering all the receipts, numbers, checks, cash, electronic images, paper, paper, paper….. They are the Balance Sheet, Income Statement (or Statement of Profit and Loss), and Cash Flow Statement. I mention the end results first as that is how I feel we create. We see the results in our mind’s eye and then we create it. We may even go so far as to sketch it and put it on a board to use as our guidance so that we can prepare the path there. Let’s talk about the Balance Sheet. First, think of it as a selfie of your business at a moment in time. Because, like a selfie, in the next second, something changes, and getting that exact selfie moment back is next to impossible because checks are written, deposits are made, supplies are used, payroll is paid, etc. This formula never changes! Much like you need three things for a glaze recipe – flux, silica, and alumina…..you need the following three things for a balance sheet recipe BUT a glaze recipe can have varied amounts of each to achieve different results. NOT so in accounting…thus is it easier to remember! Balance sheets should always balance. If not, don’t call it a balance sheet. If printed and it doesn’t balance, use it in your next raku firing. Remember, the formula never changes! Now about the balancing part. This report results from a system used to track money created in Italy during the Renaissance. It was called the double-entry accounting system and is still known as that today. All the “ins” had to equal the “outs”. So, let’s say you sell a vase. The vase goes out of your business. In return, you plan to get something back – cash. By recording the specifics of the sale of the vase and the receipt of cash, the “ins” would equal the “outs” and the books would balance. A balance sheet can be created. If the report didn’t balance, something had been missed. By the way, don’t fret, we have come a long way and computer programs automatically do this behind the scenes. 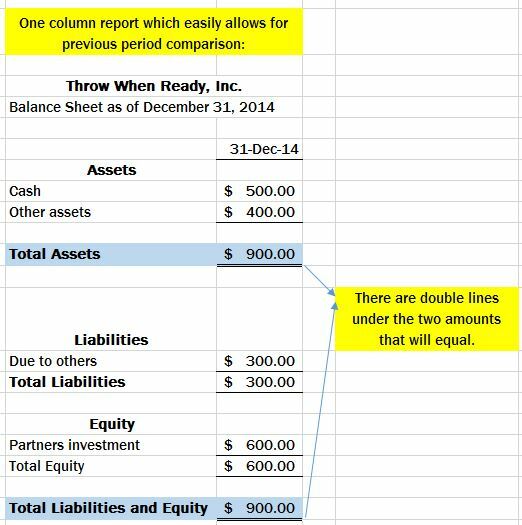 It is just nice to understand the concepts of the intention of the accounting program, so when it prints a balance sheet that doesn’t balance, and I have seen it done, you can have a reference point from which to start the questions. Since Balance Sheets are the selfie, you can compare selfies and see how your business is doing. Much like looking at a picture of yourself five years ago and today. Notice any difference? Well, you will learn to notice the differences in the balance sheet selfies as we continue this process. Let’s read a Balance sheet after we transact some simple business. During the next month, let’s buy a kiln and put it on a credit card. Kiln costs $300, paid $100 cash and the rest ($200) went to a credit card. If a Balance Sheet were created right after we bought the kiln, it would look like this and we could put the prior month on there to compare (the most current month is in the first column). What can we read from the above? Well, the story I see is that Total Assets increased from $500 to $700. Does that mean we were better off? No, you have to finish the second formula of Assets less Liabilities equals Equity to see……. There was $500 in cash in December with no liabilities. So the company had a positive equity balance of $500. The next month the company bought a kiln to add to their assets and they paid $100 in cash and charged $200 to a credit card. While the things they own or the assets went from $500 to $700, they now owe money to others or have liabilities of $200. So their equity remained at $500. Just because Total Assets went up didn’t mean that the business was better off. We have to look at both the Assets and the Liabilities to obtain a clear understanding of equity. When talking to financial types of our human race about your balance sheet, you will want to talk in these terms. At the end of the day, they will look at the equity and look at trends over periods of time. Is your equity growing or decreasing? How is that happening? 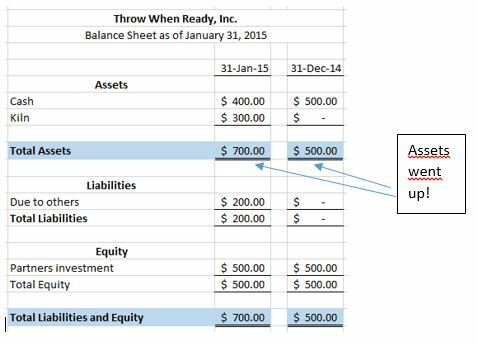 What are the ways your balance sheet can change that will tell you how your business is doing! We will get into that later. Too much of this new stuff at one time can cause you to have a brain freeze! 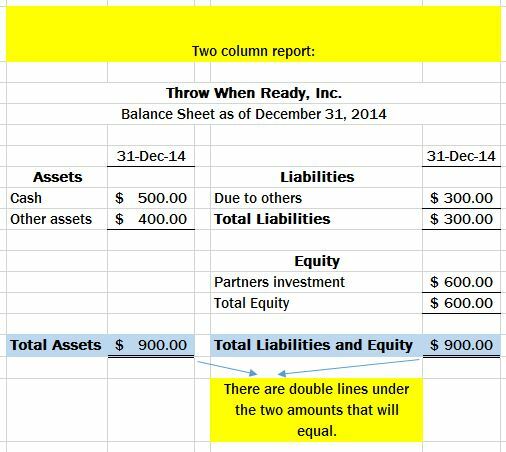 This is a very simplified look at a balance sheet and assumes we have not incurred any expenses, like rent, payroll, utilities or have made any sales. In other words, there is not an income statement to report yet. 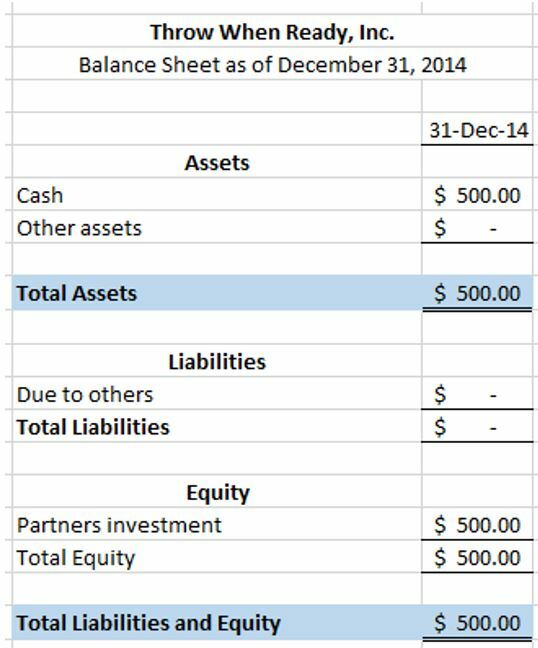 I will cover the income statement in the next blog and the effect on the balance sheet and how they work together. Equity is the result of subtracting your liabilities from your assets. Positive Equity is preferable to Negative Equity.